During the school year, over 312,000 Minnesota children are eligible for free or reduced-price meals through the National School Lunch and School Breakfast programs. However, when the school year ends for the summer, these children may not have access to the nutritious meals they need. The Summer Food Service Program provides free meals to children 18 and under to fill this gap. 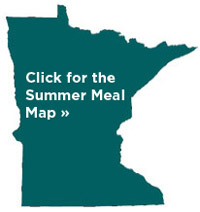 Finding Free Summer Meals for Kids Is EasyUse the Summer Meal Map to find a free meal site near you, or call or text 612.516.3663 for locations! Para información sobre las comidas de verano para niños, visite el sitio de internet http://summerlunchmap.2harvest.org/, llame al 612.516.3663, o envíe un mensaje de texto con la dirección de su hohar al 612.516.3663. Wixii akhbaar la xiriirta cuduntada lacag la’aanta ah ee caruurta loogu talagalay ee dugsiyada xiliga xagaaga waxaad ka eegtaa http://summerlunchmap.2harvest.org/, ama soo wac 612.516.3663, ama cinwaanka aad ku nooshahay fariin ahaan ugu soo dir lambarkaan 612.516.3663. Yog xav paub txog kev noj mov dawb thaum lub caij ntuj so rau cov me nyuam, mus saib rau ntawm http://summerlunchmap.2harvest.org/, hu 612.516.3663, los sis sau koj qhov chaw nyob hauv xov tooj xa mus rau 612.516.3663. Contact Jenny Butcher, SFSP Coordinator with the Minnesota Department of Education at 800.366.8922. Contact Amy Kolano, SFSP Coordinator with the Wisconsin Department of Public Instruction at 608.266.7124. Thanks to our partners and supporters, Second Harvest Heartland is thrilled to be able to offer grant funding to new and experienced SFSP sponsors. 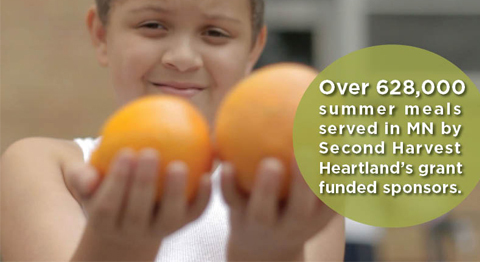 Although Second Harvest Heartland’s 2016 grant application is now closed, please check back in spring 2017 for summer 2017 funding opportunities. With questions on the grant application or process, contact Child Hunger staff at 651.403.6060. Second Harvest Heartland has outreach materials available for distribution in order to increase the participation at meal sites in your community. Outreach materials do not have year specific information and can be distributed multiple summers. To request or see outreach materials available, click on the link below.